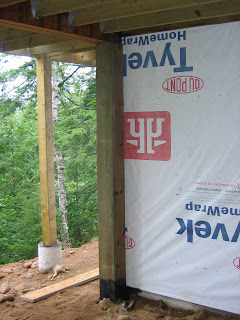 Cottage on the Edge - the DIY Cottage Blog: Beam me up Scotty! 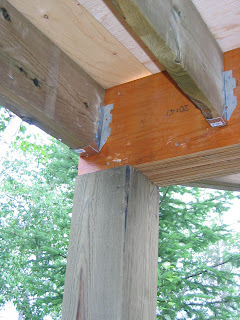 The deck for the gazebo is sixteen feet in diameter, and to create a clear space under the deck - with no supporting beams in the middle - the major beam under the center of the deck needs to be almost sixteen feet long. We laminated the beam using four engineered LVL beams. Each beam was 1.75 inched thick, 12 inches high, 15 feet 8 inched long, and was supported at either end by an 8" x 8" pressure treated post. The external end of the beam is secured to the post using steel straps (missing from the picture) as well as to the two adjacent posts on either side via a beam connected with a joist hanger. The cottage side of the beam will also be secured to its post using steel straps (missing from the picture). The post rests on a concrete pad buried four feet in to the ground, and is secured to the cottage framing using countersunk eight-inch lag screws.